How can you organize the materials and hardware that you store in your garage, workshop or hobby room without feeling overwhelmed? The first thing I attempted to organize in my shop was my large sheet goods. I got tired of walking around sheets of plywood every time I walked in the door. As you can see from the contraption in the photo below, I started off with a bang. In this article I'll share some tips for organizing your materials and hardware. If you haven't read through the article "How To Organize Your Workshop Tools" you can find it HERE. As with tool organization, you will find that French cleats are your friend. 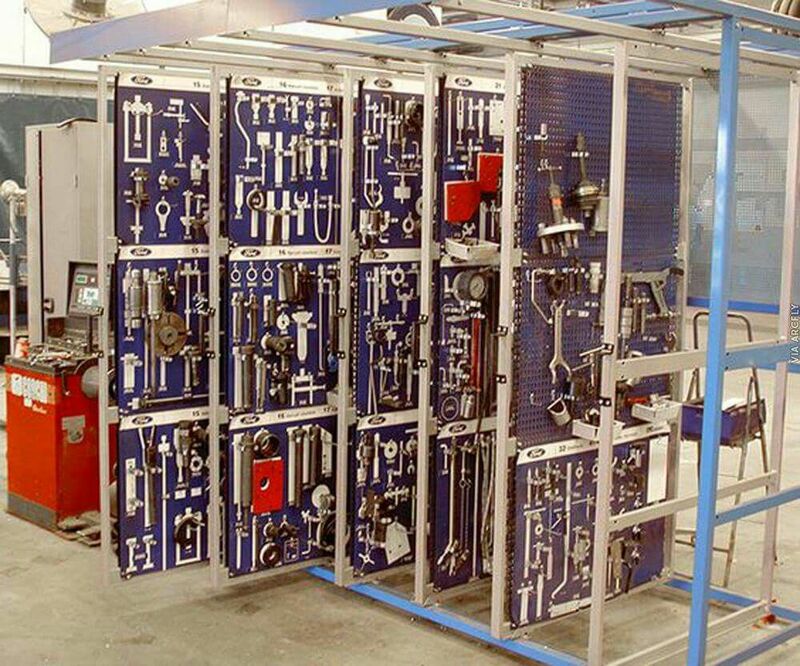 Using a French cleat wall system will allow you to easily organize and reorganize your work area with very little effort. I have most of my hardware and smaller materials hung on French cleats on the wall so they are easy to move to where I'm working and to allow reorganizing the shop as needed with no hassle at all. As you can see in the photo below I grouped adhesives and solvents together into two painted particle board shelves that hang on French cleats. I pocketed the shelf panels using a CNC router so that each item fits a particular spot on the panel. I made cheap labels by laser cutting and engraving pieces of cheap plywood and glueing them onto the front of the shelf boards. You could easily hand router or jigsaw holes in panels then glue a ply base under the panel to get the same effect. Marking the items using a Sharpie marker on pieces of tape would be a quick and easy way to label the shelves. Wait until you have used your layout for a while and feel comfortable that you don't want to change it up before you put much time into making it look nice. Avoid over processing. I know what you are thinking... "I can't let go of my miscellaneous hardware jar, bin, box... whatever", and maybe you don't have to, but I can tell you that letting go of the fear that you won't have something when you need it is an important first step. I thought I could sort all of that hardware and quickly realized that I could replace almost everything I had in the pile for under $100 and it would all be very easy to organize. So, I bought 16 organizing boxes from Harbor Freight for about $5 each on sale and started thinking how I wanted to group all of my hardware. This will be different for every person and will depend on what you do the most in your shop but I'll share my list just to give you an idea how this process worked for me. 1. Get rid of everything that can't be placed in a labeled container or holder. 2. Label everything, even if you do it with tape and a sharpie marker. If you can't label it, don't keep it. ​ Bright Ideas! Be inspired by the best of the rest. Sometimes you just have to see an idea implemented before the bells go off and you form your own visions about how to turn a heap of disorganized piles into an organized peaceful place where you can find anything you are looking for without thinking twice.